Clothing & Shoe Donation program throughout Southern California raises over $275,000 to date for We've Got Your Back nutrition program. Together, ATRS and GCHope are making a positive impact on those living in poverty. The annual Tackling Child Hunger Celebration on Tuesday, May 3 was marked by a special celebration this year. The fundraiser benefits Giving Children Hope, an Orange County based charity filling local and international needs. American Textile Recycling Service (ATRS) representatives were on hand to present a big check to further support this great cause. The celebration, sponsored by United Healthcare and held at Rock & Brews in Los Angeles, featured raffles, prizes and other festivities. Giving Children Hope received 15% of all food and beverage sales from attendees. 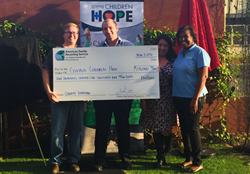 The big check presentation was conducted by Fonta Stavropoulos, SoCal Market Team Manager for ATRS. The check encompassed total donations provided through the ATRS Clothing & Shoe Donation Partnership with Giving Children Hope, which has exceeded $275,000 to date. From disaster relief and international aid to combating local hunger, Giving Children Hope serves so many people across the globe. ATRS donations exclusively fund its We've Got Your Back program which feeds over 1,300 local families living in poverty each week. Through the program, backpacks are filled with nutritional food and distributed to students in 60 schools throughout Orange County. Since its inception in 2012, the ATRS Clothing & Shoe Donation Partnership has helped provide approximately 1.06 billion much-needed meals. "Through the faithful support of ATRS, we are serving more people while improving our services," says Sean Lawrence, Executive Director of Giving Children Hope. "Together, ATRS and GCHope are making a positive impact on those living in poverty. We are extremely grateful for the communities supporting this clothing donation program and for the people we have the privilege of serving." Southern California residents of nearly 90 different municipalities can support Giving Children Hope's mission all year round by dropping off gently used, unwanted clothing, shoes, soft toys and other household textiles in their neighborhood ATRS Donation Bins. Simply call the 24-Hr Hotline at 866-900-9308 or visit http://www.atrscorp.com to find a nearby bin. Every donation provides monthly funding for this deserving charity while keeping usable textiles out of Los Angeles-area landfills. American Textile Recycling Service (ATRS) is the nation’s fastest growing textile recycler. Its socially responsible business model provides free textile recycling solutions for the public, job stimulation worldwide and much-needed funding for worthy local charities. Easy, convenient ATRS Donation Bins are available throughout Southern California, Texas, Arizona, Atlanta, Colorado, Florida, Indiana, Michigan, Oklahoma and Tennessee. ATRS is committed to keeping textile waste from local landfills and promoting a greener tomorrow. For press inquires, contact pr(at)atrsonline(dot)com.